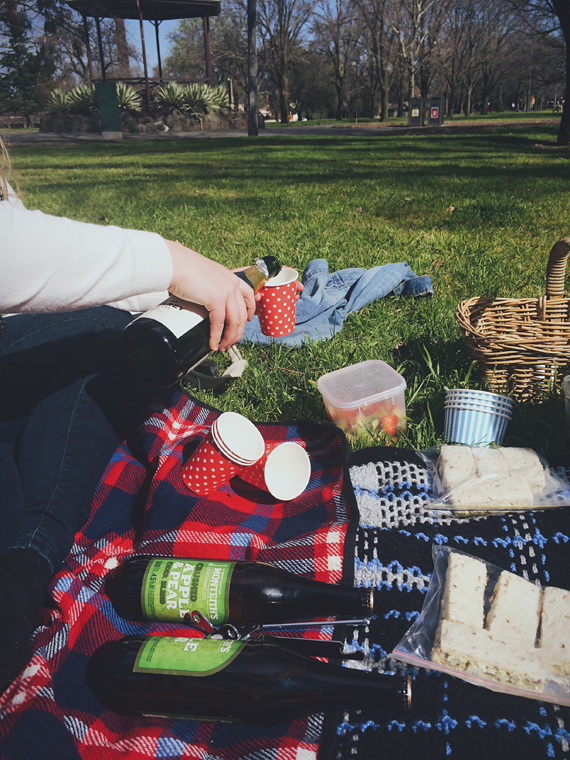 While spring won't officially be here until September 1st, yesterday was such a glorious day that I tentatively feel that I can pronounce winter officially over. Yes, it was a balmy 18 degrees, the sun shining and birds were literally building a nest in a tree in my back yard. Instead of participating in my usual Saturday ritual (read: lounging around in my pyjamas and browsing Tumblr until midday), I thankfully had an excuse to enjoy this beautiful day. 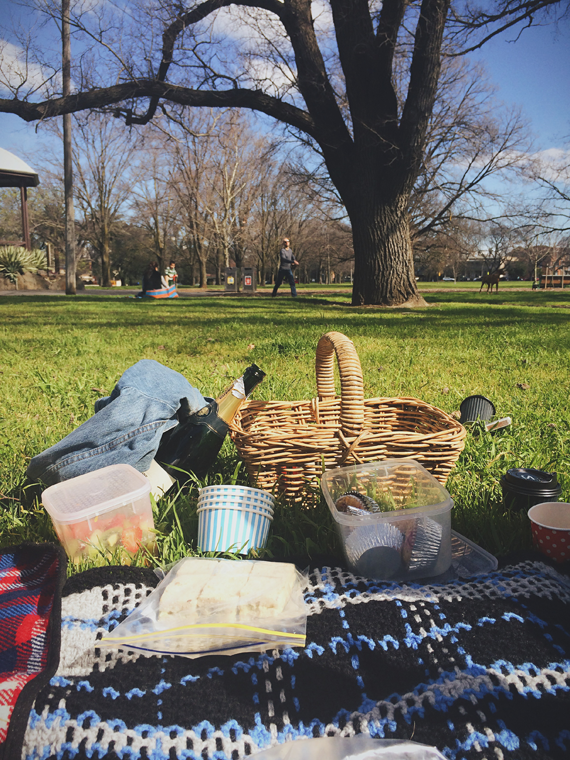 A friend who recently moved away from Melbourne was coming back for a visit, and suggested (and provided) a picnic at Darling Gardens in Clifton Hill. I figured the best way to celebrate the glorious return of weather above 12 degrees was to bust out my pasty legs and dress for the sun. Now, at this stage I feel it would be remiss of me to neglect to mention again that I am not a fashion blogger. This fact becomes more painfully obvious when you see the pitiful mirror I have to work with when taking photos of my clothes (and no, I haven't yet crossed the point of no return where I ask my boyfriend to take photos of me). Having written that disclaimer, I do get a kick out of taking full-length selfies to remember particular outfits I've worn. Here's what I wore yesterday. 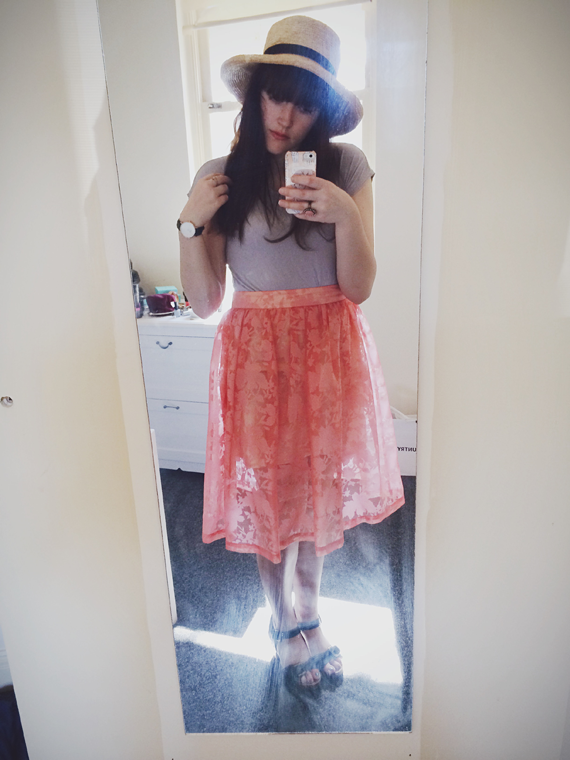 The peach skirt is pretty much spring in a nutshell for me. It even has a floral pattern - here's a closeup for more detail. 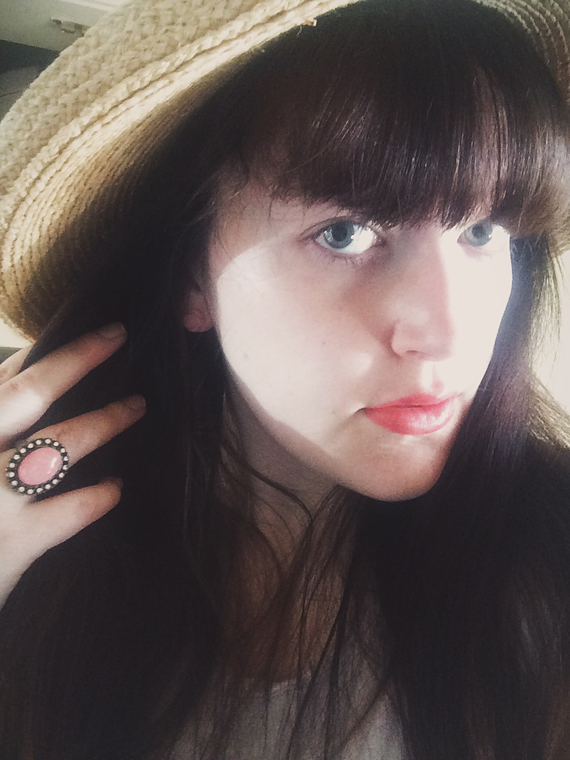 Just to really round things out, I also wore rose earrings. 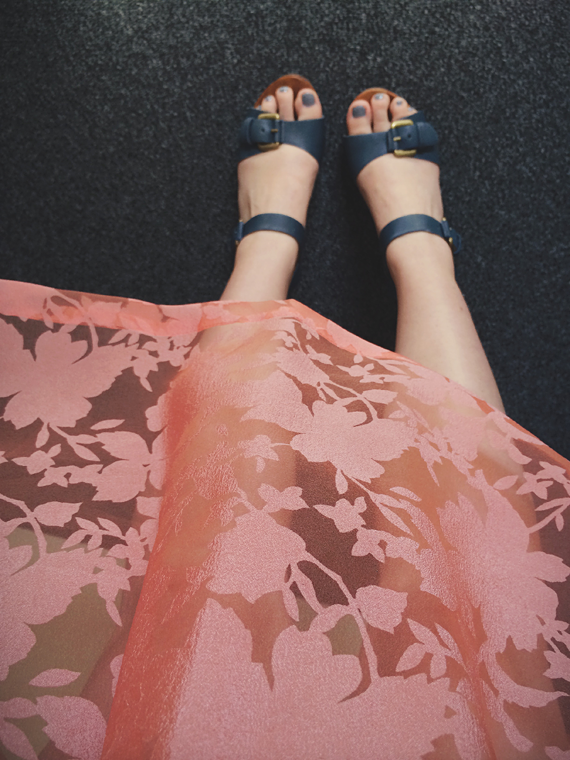 Before you say it: I know, I know, florals for spring? Groundbreaking. It was so wonderful to spend the day with some of my best friends, and since one of them had just had a birthday we kicked things off with some champagne. We hung out at the gardens all day, and it made me realise how rare it is for me to just be content with myself and surroundings. I often feel that I can't properly relax, that I need to rush off as soon as I've finished whatever it is I've been doing (even when I'm doing things I enjoy like eating, drinking, or talking). I think it comes down to the constant need to not "waste time." Seeing it written down makes it sound a little silly, but I really do spend a substantial amount of my day trying to use my time as efficiently as possible. It's a wonderful thing when you actually manage to slow down and (as cliche as it sounds) just appreciate the moment, as these scenarios can be few and far between. So this spring (and summer), I'm looking forward to "wasting" my weekend in many other gardens, staring up at the sky and talking lazily with my friends all afternoon.